Something from us to help you move in. It’s not our way here at Global Self Storage Alexandria to leave you hanging as you look for a way to transport your things from your home to our storage facilities. 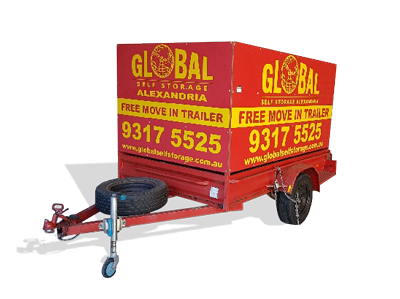 We offer a free move-in trailer Sydney-area-wide to help meet the needs of any mover looking to get their next move going. We realise trailers are not always readily available to most people, and that the average person doesn’t own one and likely doesn’t even know someone who can lend a trailer, so we took away the hassle and cost of shopping around for a rental and even purchasing one that you may never use again. And here’s what it looks like! We offer an 8ft x 5ft (or 2.4m x 1.5m) cage trailer – This cage trailer hooks to the back of your vehicle by a standard ball hookup and securely holds all of the contents in with high, raised caging. The open top is ideal for extremely tall items like dressers, mattresses, lamps and bookcases, though the comparably smaller area of the base provides limited space to lie items flat or collect several bulky objects. You may also have enough room to lie a large dresser or bookcase on its back and stack other things on top of it. There is no top, so your upward space is essentially limitless. In the end, you’ll need to consider your exact needs. If you’re looking to move your things into our facility and these free moving trailers aren’t what you need, see our free Move-in van option as well.